China's Tianhe-2 supercomputer has just been overtaken as the world's fastest by another Chinese computer, the Sunway TaihuLight, capable of 93 million billion floating-point operations per second. But TaihuLight gives the Chinese another source for national pride: It's built using Chinese chips, unlike its predecessor, which used processors from Intel. 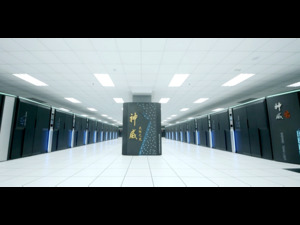 And that's not all: The 47th edition of the Top500 supercomputer rankings now contains 167 Chinese systems, putting that country ahead of the U.S. with 165. TaihuLight achieved its Linpack benchmark score of 93 petaflops using 40,960 Chinese designed and made SW26010 processors. Each processor contains four management processing elements (MPEs) and four blocks each containing 64 computing processing elements, making 260 cores per processor and a total for the whole system of 10,649,600 cores. Tianhe-2, which has dominated the Top500 list since June 2013, in comparison, has a benchmark score of 33.9 Pflops, and contains 260,000 Intel Xeon E5-2692v2 processors, each with 12 cores running at 2.2GHz, for a total of 3,120,000 cores. TaihuLight's sudden arrival at the top of the list puts paid to a claim by oil company Total that an upgrade to its Pangea computer would make it the 10th-fastest in the world: It's jumped up the rankings, but only to 11th place. One much-publicized computer you won't find in the Top500 rankings any more is Tulip Trading's C01N. Allegedly built by self-styled bitcoin inventor Craig Wright, C01N entered the rankings in 64th place in November 2014, jumping to 15th place in June 2015 following a claimed upgrade. "When doubts about this system surfaced, we tried to independently verify its existence, but ultimately could not," Top500 list maintainer Erich Strohmaier said via email. C01N initially made it into the November 2015 ranking, in 17th place. "We meant to remove it at that time, but it fell though the cracks for a while. It should get removed from all lists, but older lists get much less attention (and care) than the newest," Strohmaier wrote. C01N was removed from the November 2015 rankings some time in May, cached copies of the list show, with machines below it all moving up a rank.